A common life experience question is this: what advice would you give to your 18-year-old self? The thought occurred to me as I recently realised that 40 years ago, in 1978, I joined a political party with starry-eyed notions of a career in politics. Starting out, I’d no idea of how to become an elected representative at any level. With no family pedigree in any party – nor any profile whatsoever – I was starting out on the bottom rung. Such was my lack of local contacts, I had to look up the ‘Yellow Pages’ telephone directory to find an address for Fine Gael in Waterford to write to. I joined the party and Young Fine Gael (YFG) as an ordinary member – a volunteer worker. My progression through the ranks was incremental. Branch officer, district organiser; YFG nominee for the Enniscorthy Urban Council elections; councillor 1979; general election candidate for the Wexford constituency. A combination of brilliant mentors, acute ambition, outrageous opportunism and incredible luck saw me elected as the youngest TD in June 1981. Right now there’s a massive ‘Situations Vacant’ sign over Irish politics. Next May, vacancies arise for 949 councillors and 11 MEP positions. I expect on or before then, 160 TD positions will be filled. How to become a TD? My emphatic advice always to any wannabe politician: start and stay local. A career path through the local council is the best way to build a constituency base of ground organisation and voters. The Government’s formal approval last week for a substantial boundary increase for Cork City Council, and to merge Galway County Council and Galway City Council within three years, shows there is real recognition at the highest level for the importance of councils in paving the road to power. The council route offers a perfect bedrock of core support and a foundation for national career politicians. You have to appreciate that local voter loyalty is as important as liquidity in business – without it, you’re insolvent. The flip side of this is that the ‘ground-up’ structure ultimately produces a dubious talent pool for ministers, irrespective of which party is in power. Parish-pump politics can feed into a narrow national gombeenism. Politicians will do whatever is necessary to survive in their own backyard. This can distort a vision of national priorities in the short-term pursuit of personal priorities. I reckon less than 5pc of people are actually political anoraks, hard-wired into current affairs, elections, or a preoccupation with influencing public affairs. Having exited politics, my subsequent media perspective on our parade of politicos has hardened my reservations about the Irish political career entry system. It can stymie the best recruits. The pettiness and limitations of local government can be suffocating if you are not prepared for it. The truth is that being adept at handling planning permissions, refuse collection, amenity development or road traffic regulations is just not compatible with developing the skillset for legislating or complex policy development. No surprise then that the Dáil is over-populated with glorified county councillors, condemning us to the continuation of a thriving leprechaun politics. The lack of preparedness shows itself in many ways. Important research reports aren’t read thoroughly. TDs’ time spent on constituency work limits their ability to scrutinise the detail of parliamentary bills. Debate degenerates into generalised waffle. The real political content is often steered by civil servants, vested interests or their lobbyists. On radio and TV panel discussions, I find the strongest contributors, with informed researched arguments, aren’t politicians. Politicians too often blather inane nonsense. TDs may do very well by being cute, rather than clever. Parliament and politics is the poorer by being deprived of the best brains. People who’d make excellent TDs are being locked out. I’m thinking of two political anoraks I feel would make fine deputies. Barrister, author and analyst Noel Whelan is the son of a Fianna Fáil councillor in Wexford. He stood for Fianna Fáil in the 1997 General Election unsuccessfully in a Dublin constituency, having been employed in Fianna Fáil HQ. He’s been heavily involved in multiple referendum campaigns – opposing the Seanad abolition, marriage equality and repealing the Eighth Amendment. His front-line activity has shown his political energy and appetite for making a difference. But our current exclusively localised career system denies the possibility of him being a TD. Chris Donoghue, my former Newstalk radio co-presenter, is also an absolute political anorak. 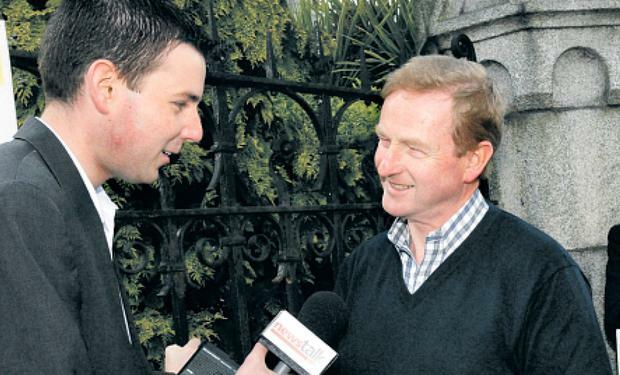 He’s left the media to be special adviser to Tánaiste Simon Coveney. He’s fulfilling his political ambitions by operating at the highest level of Irish Government in the context of Brexit and international affairs. Must he too become an apprentice to politics by having to become a councillor first? Political leaders aren’t prepared to embrace the perfect solution, namely significant electoral reform – a list system whereby a proportion of TDs could gain career entry other than through the traditional constituency route. They still could find ways to parachute the best brains into Leinster House through national candidate selection. Meanwhile, the top elected job is also now up for grabs. A presidential vacancy. Again, the same old access barriers apply. It is sobering to reflect that the greatest political, social and secular changes have come about through both recent referendums – primarily driven by civic society. Not the body politic. So who might best embody this modern Ireland as first citizen? Three people with their hands up are: Fergus Finlay, Norah Casey and Joe Brolly. Each would bring their own strand of Irish society to Áras an Uachtaráin – respectively as voices for children/disability rights, feminism in the context of domestic violence, a Magdalene survivor ambassador, and Northern nationalism/GAA. Others exist outside the confines of the Leinster House bubble of insider-ism who could be a political force, without being tethered to a party. Leo Varadkar, Micheál Martin and Mary Lou McDonald (plus their head office strategists) owe the electorate more than “a safe pair of hands” in the present incumbent. The inconvenience of distracting them from their core general election campaigns should be secondary to giving us the most modern, appropriate choice for a new head of state. Voters most recently proved again they’re ahead of the politicians. Being a TD today requires sophistication, as well as hard graft in the community. As I rethink my guidance to 18-year-old political aspirants, political parties should consider rebooting their candidate selection models at every level. Just because there is a leprechaun at the end of every rainbow doesn’t mean they have an automatic entitlement to end up in the Dáil.